LOS ANGELES (AP) — A Los Angeles man suspected of making a hoax emergency call that led to the fatal police shooting of a Kansas man told a judge Wednesday he would not fight efforts to send him to Wichita to face charges. Barriss stood behind a glass wall dressed in black with his hands cuffed at his waist and provided brief answers to a judge’s questions, acknowledging he was the wanted man and had voluntarily signed the waiver. Barriss has been charged in Kansas with making a false alarm, according to court papers. The charge for calling police or a fire department and knowingly giving false information is a low-level felony in Kansas that carries a maximum of 34 months in prison. Other charges could be filed after Wichita prosecutors review the results of a police investigation. A more serious potential state charge would be second-degree murder for unintentionally causing a death by reckless actions, said Elizabeth Cateforis, a law professor at the University of Kansas. That can carry a sentence of up to about 20 years. Barriss has a history of making bogus calls to authorities. 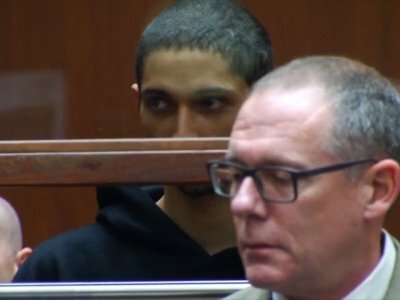 He was released from the Los Angeles County jail last year after serving less than half of a two-year and eight month sentence for phoning in two fake bomb threats in 2015 that cleared out the KABC-TV studio in nearby Glendale. Glendale police who investigated the bomb scare found about 20 other incidents where Barriss had phoned in threats to universities and media outlets around the country, Sgt. Dan Suttles said Wednesday. The FBI assisted those investigations, but deferred to state prosecutors, spokeswoman Laura Eimiller said. In the Wichita case, police have characterized the phony call as a case of “swatting” in which callers try to get a SWAT team to respond to a bogus report. When Finch came to the door, police said he moved a hand toward his waistband and an officer, fearing he was reaching for a gun, fired a single shot and killed him. Finch was unarmed. The hoax call reportedly was made after a dispute over a small wager online in a “Call of Duty” online video game tournament, according to Dexerto, a news service focused on gaming. Finch’s mother has said her son wasn’t a video game player. Kansas authorities have to pick up Barriss by Feb. 2, Los Angeles Superior Court Judge Deborah Brazil said. Hegeman reported from Wichita, Kansas. This story has been corrected to reflect that a fugitive charge was filed in Los Angeles court and to identify the Wichita police chief as Gordon Ramsay instead of as Gordon Ramsey.